We expect increase in precip intensity due to anthro climate change. An Australia-wide study sees storms shrinking in both area and duration together with increases in peak rainfall rate. This will stress stormwater systems leading to more frequent flooding, an especial concern to coastal and floodplain infrastructure. Weather models are not (yet ?) good enuf to model these effects, and i doubt they will improve very quickly. I am in Perth and we talk about long term trends of decreasing rainfall patterns in the Southwest of Western Australia. This must be simply a peculiarity to our little bit of Australia, is that correct? i think the paper argues that it rains in smaller areas for shorter times but with greater intensity. I dont think it says much about total rainfall. "A linear trend analysis indicates a change in the estimated rainfall area from 25% to 23% over the 1998–2016 period. The trend is statistically significant at the 1% level." The total atmospheric water content remained approximately constant over 1998-2016 according to the ERA-Interim, whereas the global mean rate of evaporation increased from 1400 to 1500 giga-tons (table 1). The total 50 ◦ S–50 ◦ N precipitation increased slightly from 1122 giga-ton/day to1152 giga-ton day −1 according to the TRMM data and 1300–1308 giga-tons according to ERA-Interim "
The odd part is we see from the supplementaries that total precipitation has remained constant over land, but increased over ocean. Very intersesting paper. Read the whole thing. If China creates more rain, is there not going to be a place that will get less rain ? On China rain--by the time that the air mass gets to the Tibetan Plateau there is basically no way to add much additional water vapor. If the cloud seeding actually works, which I question, it will dry the air mass and make it less likely to rain downstream. However, this dry air mass will be interacting with wet ones coming from off the ocean over China. Ultimate answer is that it is complicated to what extent it will affect rainfall in other regions. Half or more of the Ocean beaches are under caution for high level of bacteria. The run off has turned the Ocean brown for what appears to be several miles to seaward. ... Our results suggest that the short-term carbon balance of ecosystems may be more sensitive to respiration losses than previously thought and that model simulations may underestimate the positive carbon–climate feedbacks associated with respiration. ... Ecosystems either soak up carbon through photosynthesis—a negative feedback that could reduce future warming—or release it through respiration—a positive feedback that could enhance future warming. Understanding how climate change might impact ecosystem photosynthesis and respiration is critical for predicting future carbon dynamics. Liu's team discovered that whether ecosystems across the U.S. uptake carbon or release it is dependent on water availability. The primary control switches from production to respiration at an annual precipitation threshold between 30 and 35 inches in the contiguous United States. The carbon balance of ecosystems in the dry West is very sensitive to photosynthesis. In contrast, the carbon balance of more mesic Eastern U.S. ecosystems is more sensitive to carbon lost through respiration. However, climate models do not reflect this precipitation threshold. Liu and his co-authors determined that these models are far too sensitive to photosynthesis and not sensitive enough to respiration, suggesting the Earth's ecosystems may lose more carbon to the atmosphere in the future as surface temperatures continue to warm. "This study suggests we know more about the negative feedback loop and less about the positive one." Older homes in this area NJ were built with porous cinder block, these changing rainfall patterns dry/very wet are contracting expanding the Marlboro clay substrate, changing the static pressure loads on home foundations = Step cracking then horizontal cracking….a new industry has come alive….vertical carbon fiber straps epoxied to foundation walls in an effort to stabilize the walls. It el work for a while…. maybe. Re: "vertical carbon fiber straps epoxied to foundation walls in an effort to stabilize the walls. " This might need a different thread, but i doubt epoxy/carbon fiber. I have stabilized failing concrete block wall in basements in clay, and it takes large steel members, lots of digging and most important fix the drainage because it is hydrostatic pressure as well as clay swell/shrink that kills you. Sometimes pile driving is involved. My experience with epoxy/carbon strap is that it mebbe ok above grade where you can see failure, but below grade moisture degrades the epoxy , and believe it or not, things eat away at it. Then it fails invisibly. But perhaps they have better and more toxic epoxy. The few times I've worked with expansive clay it seemed like a force of nature. I patched what I could & sold the house. In London I occasionally came across a house/terrace that had a land drain, remote [low mts.] from the buildings, that fed into a sump before discharging into the main drain. Usually a couple of feet below the clay the foundation brick courses were laid on. Unless they were damaged by trees they controlled the water table locally. These days a bore hole and pump might serve the same purpose. Their installing these straps on basement interior walls (not mine). I've installed 120ft of subsurface piping to carry water away from the house....so far, so good. I meant to move this to 'Places becoming less livable" hit the wrong button. In Ocean Grove the 200 yr old homes have brick foundations using beach sand for mortar …..0pps. They simply build new support walls using block inside the basement w/a false front. Sidd...the carbon fiber straps were to be installed inside of the basement walls....but not by me. This conversation belongs else ware…..but thanks. Numerous human and environmental systems are sensitive to the spatial and temporal distribution of precipitation, including agriculture, water supply, and ecosystems. Trends in observed precipitation form an important line of evidence to understand how changes may increase system vulnerabilities. Linear trends reported in US and global climate assessments reflect changes in mean annual precipitation. Mean trends may not reflect changes across other quantiles in the precipitation probability distribution, including the tails (very high and low precipitation levels), leading to systematic mischaracterization of climate risk. Here we reanalyze global annual precipitation using quantile regression to reveal overlooked trends. We find trends in the tails inconsistent with the mean in 44.4% of land area and 40.7% of rainfed agricultural regions. Previously undetected trends offer a more accurate view of the changing climate. This work enables reappraisals of risk aggregated over thresholds in human and environmental systems, enabling revaluation of threats and identification of appropriate adaptation strategies. I might imagine it's like this across much of New England. The ground simply does not have the time between rain events to dry-out .. it's like walking on a wet sponge. One basic distinction between land and ocean is that the land can dry out. We show that this is of fundamental importance for the precipitation distribution over land as it brings precipitation from the precipitating region to the nonprecipitating region. This process prevents the land–atmosphere system from sustaining precipitation over the same region and thus acts against drought or the formation of desert. Paradoxically, although dry atmospheres are known to hamper moist convection, drying the soil to its permanent wilting point generates circulations that are strong enough to overcome this inhibition. Our findings help understand why tropical rain bands broaden poleward over land, the more so the drier the soils are. Convection-permitting simulations on an idealized land planet are performed to understand whether soil moisture acts to support or impede the organization of convection. Initially, shallow circulations driven by differential radiative cooling induce a self-aggregation of the convection into a single band, as has become familiar from simulations over idealized sea surfaces. With time, however, the drying of the nonprecipitating region induces a reversal of the shallow circulation, drawing the flow at low levels from the precipitating to the nonprecipitating region. This causes the precipitating convection to move over the dry soils and reverses the polarity of the circulation. The precipitation replenishes these soils with moisture at the expense of the formerly wet soils which dry, until the process repeats itself. On longer timescales, this acts to homogenize the precipitation field. By analyzing the strength of the shallow circulations, the surface budget with its effects on the boundary layer properties, and the shape of the soil moisture resistance function, we demonstrate that the soil has to dry out significantly, for the here-tested resistance formulations below 15% of its water availability, to be able to alter the precipitation distribution. We expect such a process to broaden the distribution of precipitation over tropical land. This expectation is supported by observations which show that in drier years the monsoon rains move farther inland over Africa. Physically, the ability of soil moisture to store water and lose water in interaction with the atmosphere affects the partitioning between sensible and latent heat flux and through this the precipitation distribution in two potentially opposing ways. First, a change in the Bowen ratio affects the stability of the atmosphere and hence the triggering of convection. The most common response is that an increase in soil moisture favors the triggering of convection (18, 19) and hence increases precipitation. Following this argument, soil moisture maintains precipitation in the precipitating region. Second, the spatially localized nature of convective precipitation leads to the development of soil moisture gradients. Gradients in soil moisture lead to gradients in sensible heat flux, which can thermally induce a shallow circulation with surface flow from the wet to the dry region. This circulation can lead to the triggering of convection over the dry region (20, 21), a phenomenon that has been in particular observed in the Sahel region (22), although its signature has been deciphered globally (23). Following this second argument, soil moisture brings precipitation to the nonprecipitating region. The below are all extracts from within the paper. We use a simple formulation for the land surface in our simulations, a formulation that retains the two key characteristics of soil moisture (Materials and Methods): its spatial and temporal variability through the action of precipitation and evaporation as well as its nonlinear control on the surface fluxes via the use of a resistance formulation (Eq. 5). This model version is compared with a version where the soil moisture resistance is set to zero, mimicking the situation of an infinite supply of water. In our simulations, convection rapidly develops and produces precipitation with a daily mean of around 4.6 mm⋅d−1. The spatial distribution of precipitation (Fig. 1) indicates that in both model versions convection organizes as time proceeds. That convection spontaneously begins to self-aggregate into a large convective structure is a well-known feature from past RCE simulations, as noted previously. Interactive soil moisture leads to little difference between the simulations up to around day 60. The monthly mean precipitating area, calculated from days 25 to 55, occupies 76% of the domain in both simulations. Hence, during this time period, the precipitation distribution is fully controlled by the atmosphere. This is consistent with values of the atmospheric resistance rara that are much larger than values of the soil moisture resistance rsrs, for instance 100 times larger at noon. We investigate the processes determining the spatial distribution of precipitation, in particular those leading to its homogenization by soil moisture. We focus on the simulation with interactive soil moisture around day 60. The circulation maintains the convection aggregated in one band with minimal changes in direction (Fig. 3A). Around day 60, however, the circulation pattern drastically changes and begins to converge into the previously nonprecipitating region (Figs. 2B and 3A), called the desiccated region. Letting radiation, convection, and soil moisture interact with each other in an initially homogeneous land–atmosphere system indicates that the fundamental role of soil moisture is to bring precipitation from the precipitating to the nonprecipitating region. much more within paper…..which I assume is still dry. Preliminary research by precipitation expert Dr. Kenneth Kunkel of the North Carolina Institute for Climate Studies, announced in September, found that the three highest-volume rainfall events in the U.S. in the last 70 years have occurred since 2016: Hurricane Harvey in Texas/Louisiana in 2017, Hurricane Florence in North Carolina in 2018, and a March 2016 storm in Louisiana. It is highly unusual to get three such extreme events in one three-year period, and the odds of this occuring were increased by global warming, which boosts the amount of water vapor in the air and increases the frequency and intensity of heavy precipitation events. Dr. Kunkel’s ratings were based on four-day rainfall totals over an area of 14,000 square miles (an area 40% larger than the state of Maryland). 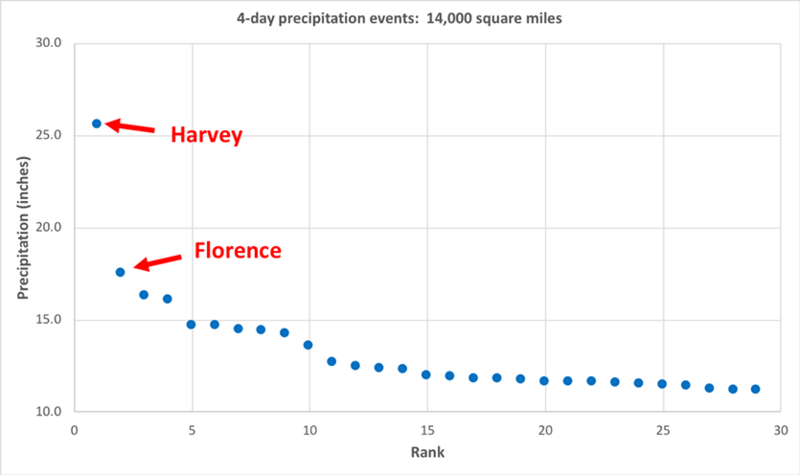 Harvey delivered an average of 25.6 inches of rain over an area of 14,000 square miles, while Florence was a somewhat distant second place, with an average of 17.5 inches of rain over a like-sized area. "A global study has found a paradox: our water supplies are shrinking at the same time as climate change is generating more intense rain. And the culprit is the drying of soils, say researchers, pointing to a world where drought-like conditions will become the new normal, especially in regions that are already dry. "The study – the most exhaustive global analysis of rainfall and rivers – was conducted by a team led by Professor Ashish Sharma at Australia's UNSW (University of New South Wales) in Sydney. It relied on actual data from 43,000 rainfall stations and 5300 river monitoring sites in 160 countries, instead of basing its findings on model simulations of a future climate, which can be uncertain and at times questionable. "For every 100 raindrops that fall on land, only 36 drops are 'blue water' – the rainfall that enters lakes, rivers and aquifers – and therefore, all the water extracted for human needs. The remaining two thirds of rainfall is mostly retained as soil moisture – known as 'green water' – and used by the landscape and the ecosystem. As warming temperatures cause more water to evaporate from soils, those dry soils are absorbing more of the rainfall when it does occur – leaving less 'blue water' for human use. "It's a double whammy," said Sharma. "Less water is ending up where we can store it for later use. At the same time, more rain is overwhelming drainage infrastructure in towns and cities, leading to more urban flooding." A few very basic questions. As a volume of air is heated it expands though mass remains constant. If we began at 50% humidity, then heated our mix, the mass of water vapor remains constant even as the volume of air and water vapor increase and the humidity index drops. As humidity drops the delta between wet bulb and dry bulb temperature increases. If no water is added to or precipitated from or mix, can the dry bulb temperature ever drop simply as the result of heating the atmosphere? If we began with fully humidified air, (100% humidity), wet bulb temperatures must be equal to dry bulb temperatures prior to heating. If we began with fully desiccated air, (0% humidity), the delta between wet and dry bulb temperatures is already maximized prior to heating. 100% humidity air must produce the greatest possible delta between wet and dry bulb temperatures after heating. Would heating a 0% humidity atmosphere by 1C raise the dry bulb temperature by 1C. If our experiments took place over open water, would atmospheric humidity remain ~constant due to increased evaporation? I managed to work out some of my questions merely by writing them down. I love your questions Terry! In my experience, wet bulb temps are more useful for describing how the air feels than for describing the amount of heat in the air. Therefore, no, dry bulb temperature could not fall as the temperature rises....but it might feel that way! We feel the opposite when the temperature is dropping in winter- because the amount of water vapour remains constant, the relative humidity rises as the temperature falls and it feels colder than it really is....I think! My experience in College Station Texas: At night in summer the air would cool down nearly to the dewpoint, about 70 deg F, so would be near 100% relative humidity. Late afternoon the temperature would be around 103 deg F, and the relative humidity would be about 30%. The air was fed from the Gulf of Mexico, so there was plenty of water vapor.